09What do we know about Viking ships? 26Spend 24 hours kind of living like Downton Abbey in this distinctive hotel. 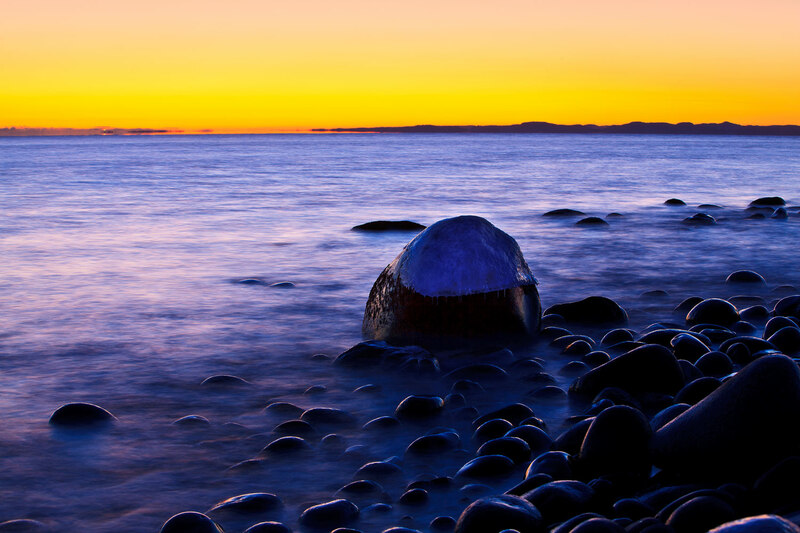 If you’d like to experience one of the most historic and fascinating natural areas in Scandinavia, you can travel to the majestic pebble beach of Mølen, as far south you can get in Vestfold county, Norway. Mølen is a part of the Ra Moraine, a large end moraine that extends around the whole of Scandinavia. End moraines are ridges of unsorted material including stones, sand, gravel and clay, which were deposited by a glacier. The Ra Moraine was formed during the last Ice Age. The Ice Age was at its coldest about 20,000 years ago. Then, the ice sheet covered the entire Scandinavian Peninsula, and the ice front extended all the way down into Denmark and Germany. The weight of the ice depressed the land way down. Fortunately, the climate became warmer, and the ice melted back. The Ra morain is the result after the ice standing more or less still in a period of 300 years. 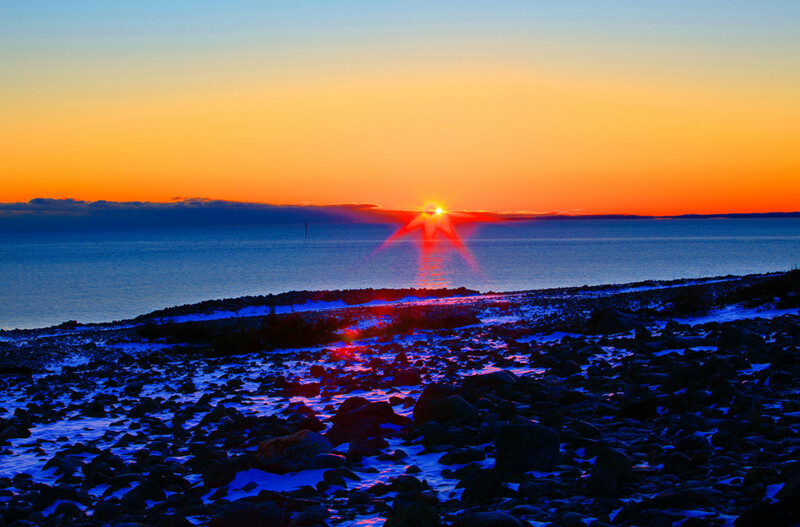 Mølen was formed in the edge of the ice sheet between 12,650 to 12,350 years ago. 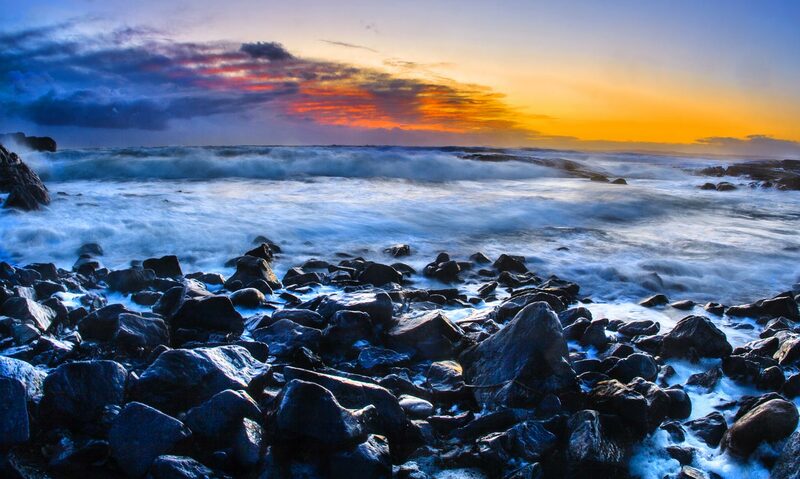 A large pile of different rocks, boulders, sand and clay was deposited and later reworked by sea and wave action. One of the attractions of Mølen is the unique area of burial mounds. Each cairn, small and large, is secretive and mysterious because many puzzles remain to be solved for us to see the full picture of why they were built and what they contain. Magical Mølen. Mølen is powerful and dramatic, with powerful waves and foam spray that kicks in from the wide open sea, towards the large pebble beach that has the greatest fate for pebbles in Norway. Mølen is also mysterious with all its mysterious burial mounds and the ship-shaped mounds from the Iron Age and the Bronze Age. Mølen is the name of a part of the stunning coastline between Helgeroa and Nevlunghavn. It has spectacular burial mounds, exciting rocks landscape, the country's largest pebble beach, and a wonderful walking area including coastal path that winds through the area. the past has real existence? Around 1500 BC, the custom of burying individuals in large burial mounds arose. 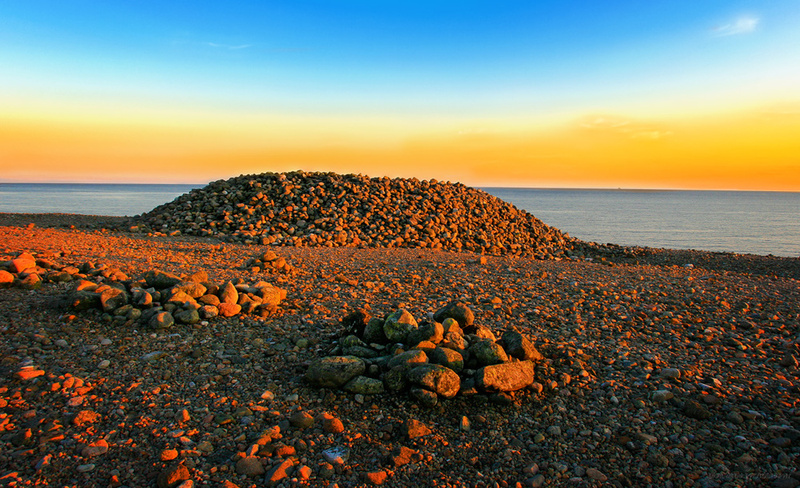 The cairns were placed on the tops of the countryside, close to the sky and overlooking the ocean or waterway. The boulder moraine on Mølen by Nevlunghavn was the perfect place for our ancestors to build tombs: Good views of the dead and plenty of building material. Burial mounds located on the surfaces of individual beach ridges formed during periods of extreme onshore wind uplift during the last Ice Age. Because of the uplift, the lowermost burial mounds may not be older than a few thousand years. But the oldest farthest might as well come from the Bronze Age, 1800-500 BC. Little is known about the mounds; however it is not difficult to understand that in pagan times the tombs were placed right here - the place where the moraine disappearing into Skagerrak is kind of a natural place for the last earthly journey. The vast burial ground contains 230 artificial stone cairns. The largest has a diameter of 35 meters. The minimum is two to three feet in diameter. Most are round, some are rectangular and one is the shape of a ship. Professor of Nordic archeology, Sverre Marstrander (University of Oslo) found around 70 ship nails and large amounts of iron chips after dissolved nails in the oval, ship-shaped rock mill "Mølenskipet" in the early 70's. Here he also found charcoal, which he dated with the help of so-called C14 samples. On the basis of this analysis, he concluded that the smoke originated from the old Iron Age. This date was immediately welcomed by the archaeologist Trond Løken, which pointed out, among other things, that the ship's shape primarily characterizes the younger Iron Age, and that iron clinking of boats did not become common until the 400's after Christ. landscape and history, are intricately linked"
Perhaps Mølen was the burial place of a branch of the mighty Ynglings? small and large burial rock mounds were laid, the biggest of them has a diameter of 35 metres. kings who ruled parts of Norway in the early Viking era. "Along the Norwegian coast from Båhuslen to Bodø, the hills and islets, islands, and headlands lay round stone mounds, often many in the crowd, all thrown together. They continue on along lakes and rivers in Götaland and over to the coasts and islands in Finland and Estonia. They form a chain of thousands; we do not know how many thousand only in the present-day Norway. " booklet Mølen in Brunlanes, published by Norwegian archaeological company in 1938.
people of Norway, Sweden, Finland and Estonia. to Brogger, primarily because of its excellent location. as majestic and silhouettes its profile against the sky. " the hypothesis Mølen as a cemetery for a branch of the mighty Ynglings. In the Bronze Age, it was common to bury the dead in the monumental burial mounds upon the heights of the landscape. The dead were to be seen - so the view of the sea and transport were the determining reasons of where and how the mounds should be. Burial mounds were erected over the grave of the most powerful people in the area. The burial caskets, built of stone slabs, were usually directly on the mountain in the middle of the mound. probably date from the early Bronze Age, 1000-500 BC. place has a unique atmosphere. When the sea demonstrates its fury, you can hear nature´s forces at work: the waves shifting the millions of small and large rocks that constitute this unique nature reserve. Therefore, it comes as no surprise that Mølen is a listed nature reserve and was also declared Norway´s first UNESCO European Geopark in 2008.
who remembered me are forgotten"
What have our ancestors symbolized on Mølen, or tried to signal to the outside world and perhaps the universe gods on Mølen? Experts are not quite sure what traditions were related to Mølen, and it remains an enigma and a mystery what burial mounds include, but archaeologists and experts are in no doubt that this is the burial mounds for a large family. These graves have a strategic location with expansive views of the countryside and the major works that sea and landmarks. You do not get such monumental tombs without basis in wealth and power. The smaller mounds are perhaps symbols of warriors who fell in sea battles or shipwrecked along with their chiefs. value, because it contains in itself an eternity." Nearly all mounds have one or more grooves, which possibly show earlier pirate-like grave robberies, looting, or so-called mound breaches. Mound breaches involve performing a ritual removal of the dead, but researchers are uncertain of the reason. It may also be that the mounds are built with an emphasis on purpose, but they are, so no one has a natural explanation for it. The youngest mounds probably originated from this era, but cairns located higher up on the beach may be older. Maybe the site has been used as a burial place for two thousand years. 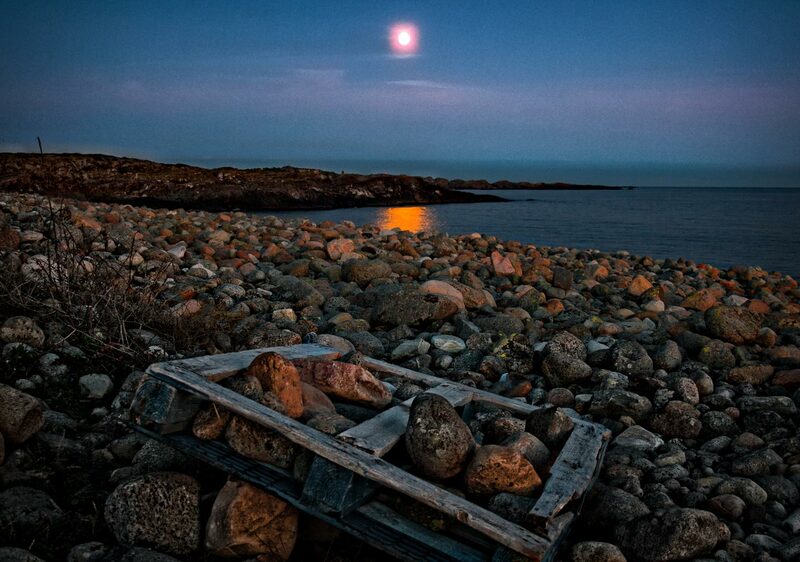 Image below: Night Mood from the pebble beach at Mølen. In June 2008, the Nordic region's first UNESCO European Geopark on Mølen opened. 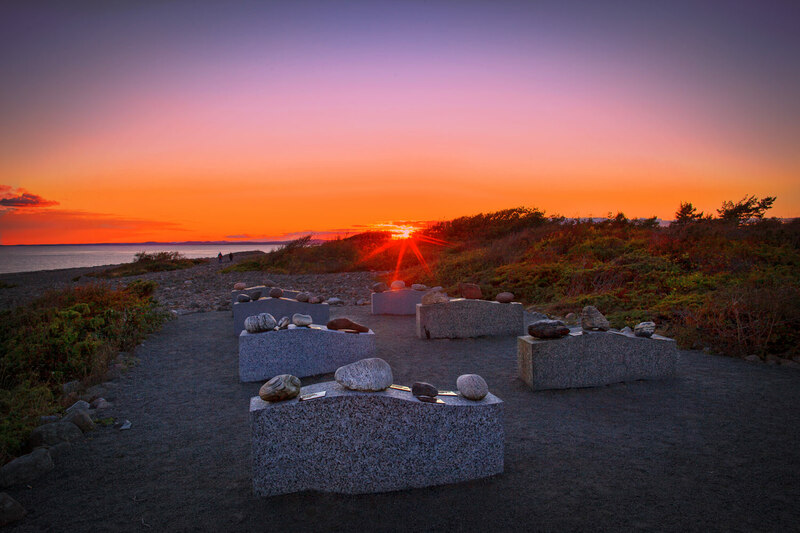 In addition, it is important to state that Mølen is listed twice - in 1939 for the spectacular grave monuments and in 1970 because of the abundant bird life on the peninsula and the waters around it. The name Mølen, mentioned in the saga year 1207, derived from the Old Norse mol, which means rock beat or stone embankment. Mølen is a majestic place in all weather and all seasons and perhaps it is even the most impressive being here on a day of extremely windy weather. Storm, sun, and rain interchanging provide fantastic lighting. It is never quiet in Mølen. With Skagerrak right outside, there is always wind in the air and always waves crashing against the shore. During the day, the swells turn sharply and you can hear the powerful water rumble. The fascinating sound is the rolling of the boulders under the water pulled by the currents. It is impressive that such a powerful sound comes from under the sea and can still be heard from the beach. You won’t ever forget the visual and sound impression from Mølen. If you leave the boulders at the shore and head along the blue marked coast trail northeastwards, you will see black rock formations, some of them with white spots. These are Permian volcanic rocks, once flowing out from large volcanoes. The ultramafic, for the most lava flows where formed while the Oslo Rift opened up. 301 million years ago. These rocks are rare on a global basis, since they are the result of partial melting of metasomatized lithospheric mantle.The white minerals are mainly albite, sometimes calcite. Mølen is one of the most important bird migration sites in spring and autumn. Mølen Ornithology station was established in 1976 by amateur ornithologists in Vestfold to monitor bird migration at one of the most interesting localities along the Norwegian coast. Ornithologists monitor bird drawing, recording, and ring marking birds. Mølen has every right to be called the birds' main airport. No other Norwegian station has registered as many different bird species. MØLEN bird conservation area was up created by conservation law by Royal Decree of the 2nd of October 1981. The purpose of protection is to protect the rich and interesting bird life and preserve an important migration and wintering area for waterfowl, particularly for the sake of diving species (diving ducks, loons, etc.). Bird life, including nests and eggs, are protected against any kind of damage, destruction and unnecessary disturbance. Windsurfing, surfing, kite surfing (kite) and other water sports are considered unnecessary disturbance. Boating rights etc. that were established at the time of preservation are allowed to continue, as long as it is for the purpose of the birds. 2. Hunting, trapping, and the use of firearms is prohibited. Let all the hurry fade away. In the rush crush of modern life, the rarities are what we value most, such as space, quiet and time. The space to breathe, a time to dream. On Palm Sunday 25 March 1016, a naval battle took place off the coast of Mølen. This is the first exact dating of an event in Norwegian history. The battle is regardedas one of the defining events in the unification of Norway, and as the biggest naval battle in Norwegian history. in Rouen in 1014, and in 1015, he returned to Norway to claim the throne. According to the sagas, the decisive battle took place at Nesjar, which is an older name for Mølen. The fleet of Olav Haraldsson consisted of 20 ships and 2000 men. Against them stood Svein, Earl of Lade and his allied chieftains with 45 ships and 3000 men. Olav's ships were larger and his crew more experienced, and he came out of the battle victorious. After his victory, Olav went ashore and, according to the saga literature, erected a cross. The place name Helgeroa (Heilagroda = holy cross) may be derived from this event. After the battle, Svein, Earl of Lade escaped eastwards through Sweden to Russia. Olav did not meet much resistance after this, and was later hailed as king over the whole country at Oyrething in Trøndelag. On July 29th 1030, Olav fell in the battle of Stiklestad. After his death he became known as «Olav the Holy» for his part in introducing a Christian legislation in Norway. St. Olav became the patron Saint of Norway and «Norway's Eternal King». It is easy to identify Mølen, located midway between Nevlunghavn and Helgeroa. Along the main road (road 51), signs are well posted to get you along on your drive to Mølen. You’ll find a large parking lot for Mølen visitors. From the parking lot, you’ll be a 5 minute walk away from where this wonderful landscape opens. .Brøgger, A.W. 1916. Borrefundet og Vestfoldkongernes graver. Videnskapsselskapet i Kristiania, Skrifter II, Hist.-Filos.Klass 1916 no. 1.